Sagittarius in 2019, is going to witness the ebb and flow of opportunities and circumstances. There will be several chances where you will get a possibility to grasp, learn, grow and implement your actions accordingly, which will improve the probability of you being successful in whatever you dig your hands in. Due to the Jupiter’s transit, there is a possibility that you may go out on a pilgrimage to very holy and sacred place close to you. You may also find yourself to be inclined towards philosophy or indulge in religious activities. Though, it is advised that you become cautious and careful from 2nd week of April and 2nd week of August, as predicted by Sagittarius horoscope 2019. As far as the finances are concerned, this year for you is going to be very profitable as we can see better profit, heading towards you in the coming year, which will make you quite stable monetarily. Apart from this, your children will lend you constant aid and support which may boost your much needed confidence. Luck is something that will undoubtedly follow you where you go, making all your tasks easy, uncomplicated and effortless. Thus, all your remaining chores and tasks will be taken care of, as is envisioned by Sagittarius 2019 yearly horoscope. Furthermore, on a more serious note, there is a possibility that you may not feel good, because of all the strain in the relationship with your family. You may have several quarrels, heated arguments which should be totally avoided so that there is no bitter experience to carry along. So, be careful and stay composed according to Sagittarius in 2019. This year, in accordance with your Sagittarius life in 2019, you may have to be cautious while taking some decisions, like the ones which are affiliated to property dealings. So, if you are taking any property inherent decisions, then try to be the wisest and sagacious of them all. Try to use your knowledge and sensibilities to achieve this state, where you can make correct decisions. Also, please do not involve yourself too much with unimportant and insignificant issues as it may have a negative impact on your reputation, which may go for a toss. It will affect you, all the more, because Sagittarius people are known to be empathetic and delicate with their emotions. Ganesha also advises you to not get into any extra-marital affairs and relationships, as it is wrong on a moral basis, and may also hamper your current relationship in a negative way, says your Sagittarius 2019 predictions. Instead of being involved in such matters, it is perhaps, more important to take good care of your health by maintaining a healthy diet and constantly exercising to make yourself more fit says Sagittarius horoscope 2019. The good news for you people is that all your altercations with your family members will be fixed and settled down, by the end of this year, says Ganesha. 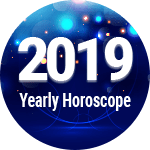 Sagittarius Horoscope 2019 Overall rating: 4.6 out of 55 based on 1428 reviews.